← Diverse SFF: Are you watching? Are you buying? If you publish independently, your e-mail account probably looks about like mine: an enormous series of solicitations and come-ons for getting your book in front of readers, all of which cost you some money, and none of which come with a guarantee. Some of these come from people that we all recognize: none of you care what my opinion of Publisher’s Weekly is because you have an opinion of your own. Some come from people that are obviously running scams, and those tend to stand out to anyone that knows what they are doing as they contain impossible guarantees of success and publicity. Then, there’s that group in the middle: people with an impressive website, maybe a magazine, and a tradeshow booth. They look impressive and legitimate, but when you’re counting your dollars to promote a book, it can be hard to let $99 loose to buy something based on an e-mail and a website. 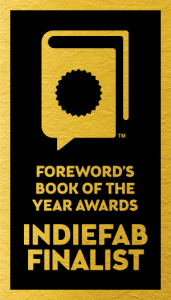 I took a shot with Foreword Reviews and entered their IndieFab Awards in 2014. I’m glad I did, and count it as marketing money well spent. Does that mean that you should enter? I have no idea. I’ll just lay out my experience and judgment about what happened, and let you decide. First, I entered twice, entering Everything I Know About Zombies, I Learned in Kindergarten under both the Horror and Multicultural Adult Fiction categories. That was my choice: no one pressured me into it, or indeed had even talked to me yet. A few days later, I got a phone call from Christie Jenuwine, the sales representative that had been assigned to me. She arranged a second call, and spent nearly an hour talking with me about my plans for the book, and going over what I could expect for my money. Of course, she tried to sell me on going to trade shows, but you can’t blame her for that. She’s a sales representative after all, so you have to expect her to sell you things. It’s low-key though, without any sense of extreme pressure. I did purchase representation at the Midwinter ALA show for January 2015. That ALA show became a lesson in reasonable expectations: I only got a few polite nibbles. What can you expect from one book sitting on a shelf with other books, with nothing to distinguish it? A booth position at one of these shows is necessary, but not sufficient. You’ve still got to market your work, and I’ve had much better results since simply by having a targeted Twitter campaign that goes on during the show to drive people to the Foreword Reviews booth. Roll forward to March, 2015, when the IndieFab Award finalists were announced and I was on the list, in both Horror and Multicultural Adult Fiction. I got shiny stickers to put on my book. You know what I did with those shiny stickers? I drove down to the local bookstore, one that had grudgingly agreed to stock a couple of copies of my book out of politeness to a local author, and showed the shiny stickers to the manager. She took all of their copies of the book out of the back room, put the stickers on them, and set them on a display table, cover out for everyone to see, in the middle of their store. Let me repeat that. She put all of their copies of my book on a table in the center of the store after putting the shiny stickers on the cover. They sold much faster that way. She ordered more copies, and I’m still for sale in the store. The other thing I did with that shiny sticker was call the Phoenix New Times, our local entertainment and social issues newspaper, and tell them about it. That shiny sticker earned me an interview article. Then June came, and the award announcements at the main ALA show in San Francisco. I received an Honorable Mention in the Multicultural Adult Fiction category, and nothing for Horror. That surprised me a bit, but, putting on my marketing hat, I went with it. After all, a zombie novel that wins a horror award is just a zombie novel, but a zombie novel that wins an award for Multicultural Adult Fiction is, well, special. That special status works well for me. My ads with the best response rates rely on it. And what else is special about a zombie novel that wins an award for Multicultural Adult Fiction? It’s in libraries, and there’s no one to thank for that but Foreword Reviews. For you non-authors that have read this far, for a self-published book to be in any library outside of the author’s home town is unheard of. So, there’s the story. I’m still struggling with the marketing of this work, but that’s the nature of the book: convincing adults that they want to read a book about small children is an uphill battle in any case, and convincing them that they want to read a book about black and Hispanic children fighting and dying after they’ve been abandoned in a zombie-infested Bronx is a hill so steep it looks more like a cliff. Having an award win is an invaluable weapon in my arsenal.